Because of zoning laws that target the off-grid lifestyle, many off-gridders have moved to areas in the Southwestern United States to escape overzealous zoning officials. But this week, off-gridders were dealt another blow in an area of the country that has become a magnet for people looking to live a more self-reliant lifestyle. Other changes to the code would require water, sewer, and electricity to be installed prior to building permits being issued – something that local residents say specifically targets those who came here to live off-the-grid. Thank you so much for covering what’s happening here. We’re all very grateful. No problem… If anything changes let me know. Those poor people. I hope you guys get justice down there! What the hell is wrong with this country? I’ve been looking at land in this area until I heard about this. It’s getting to be that there is no where left for us to go. Where can we go now that the govt doesn’t tell us what to do. Our land or not. exactly. the only thing i can think of is the oceans left. outside 12 nautical miles of us coastlines is international maritime law. however this presents a problem – PIRATES, and the fact that the UN has taken control of the worlds oceans. but its the only place that i can see that still has some freedom left unless you wanna go to mars when they colonize it?? I would tell you to head for our location, but ground is very expensive if you can find it. It will run you $10,000+ an acre and you have to buy 20 acres to build, unless you purchase it from family or it was previously divided. We lived in the area and were able to find a couple nice pieces in the country 15 years ago, but that took local knowledge and private land sales. The ground never hit the market. Imagine what our founders would think. This is why they came to this country, and now the spirit that helped make this country great is now something that can get you thrown in the slammer. I live offgrid in a 5th wheel here in the valley.. sorta. I’m up in the pinons.. i’m seeing both sides of this and although i personally would not piss on a cop or a government employee to save their life, i must say i see the locals point.. most of the folks i meet at the wells are here for 1 thing. Most think they will make their fortune growing grass and dealing it.. hate to tell you folks this.. it aint going to happen.. the valley floor (most of us call it iraqi flats) is starting to look like a dump.. and i’m ashamed of the behavior from the ones that think they’re owed something..
Water is scarce, you have to haul it.. wells are expensive.. people have to bury their poop (thats just criminal)(and nasty) or hopefully they compost it.. i could rant all night on this..but i won’t.. ADVICE:do NOT move here without an income and have something to offer the community.. and everybody here grows pot.. theres no market for it.. you wont solve your problems at home by becoming a problem here.. good luck.. gun up, man up, shut up.. I agree luis valley. Most of the folks coming here don’t have a clue about how to live in the extra harsh conditions here. Too many with good intentions leave their trash when they get cold and hungry, to rot and leak into the ground water, for eternity. Something MUST be done to mitigate and prevent desecration of our land and water. We have rights too. Next meeting should be interesting.. think I’ll take my golden retriever and be a fly on the wall.. hope to meet you there..
luis valley, I’ve been looking for small acreage in Colorado to leave a camper and maybe build a very small off grid cabin. I’ve looked at this area and the prices make it tempting, but I’d rather be at a higher elevation with greenery. This would be a place to come for a few weeks at a time to relax and hike. Wouldn’t mind growing a few veggies but not interested in pot. Any suggestions? Don’t relocate to costilla county, everyone grows weed and in so ill plants do well like potatoes and carrots and such. They sell cheap property pay by month you go out there with nothing that’s what you have. Campers are considered nuicance the police tell you that you can’t camp more than 15days a year and there’s a 90day permit available but they will not issue you leave man gets property back because your not going to pay for something you can’t use. Win win the property owners sell property over and over he’s happy, the county is happy all that land tax revenue 40,000 lots. No extra people don’t need services etc. you get it. If you have 10-20k tie into power 5-15k septic and a well 15-40k and under 35acres can only use it inside no outside watering period. I agree with Luis. 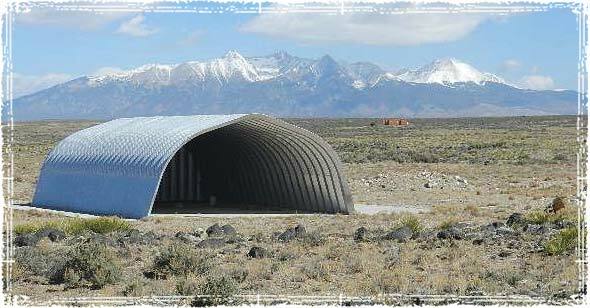 Anyone who has camped off grid in a remote area easy access has experienced what swine humans can be with their feces, urine, trash, and liberal attitude. Just tune in, drop out. Be the Gray Man, clean up, and leave no trace! Composting isn’t rocket science. Freedom seems to be a vague thing with many. And it doesn’t take money to clean up after one’s self. I decided long ago,That even with the common sense thinking about pot laws that Co. Has,It has many problems with its thinking,Government wise. @ RN.. I am a retired nurse..☺.. visit first.. get a copy of the costilla county land use regs. Food is hard to grow here.. water is expensive.. if you can abide and get along, then by all means, cmon down. 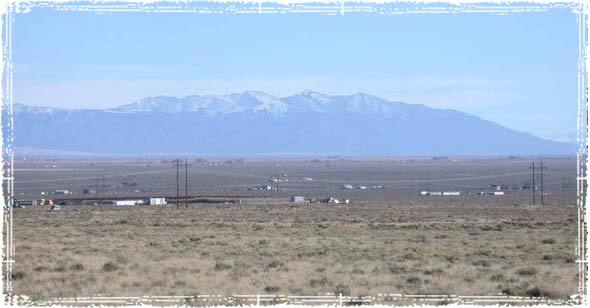 Luis valley, I just bought some land up in the pines. I’d love to have a conversation with you. Anyway we could get in touch? uhm.. burying your poop does compost it.. it will eventually be broken down by plants for nutrients as well as bacteria.. so I guess I don’t see your point. This fella should run for Mayor. That’s what Sonny Bono did when he was told he could not put a sign on his Restaurant. Win or lose. This guy is someone I would vote for based on what he said in the video. Just tell the truth. And when they ask you about things that are personal, tell them that you want to bring dignity back to America because that’s what we need. Stick to the issues and good luck. If I had money, I’d send you a check to fund your campaign and the construction of a building on your property, your headquarters. Every person fighting for his rights, fights for the rights of every other American. So it’s 7 in the morning, I can’t sleep and instead of watching infomercials I choose to watch Dog the Bounty Hunter.I find it ironic that people are allowed to squat in tents,old campers etc on public beaches that tax payers pay for.Supposedly Hawaii is Obama’s home state and yet people who work, save, and pay for their land are being kicked off for the same thing except they paid out of their own pocket. But he gave 150 billion for a terrorist state to make nukes.Me and my conservative friends agree,hard working, people who show up everyday and earn what they have or want,IT’S OVER. Laying with my dying dog at 9;13 had hopes of letting him live free on an acre or 2 in the Blue Ridge or Appalachian’s off grid. I guess I let him down. Come to North Tennessee. Many counties still have no zoning. Great climate. Plenty of water. People generally just leave people be. My condolences on your animal.. no more pain..
Northeast Tennessee is my favorite. Kingsport, new canton, rogersville. I used to live in and love Colorado.I am disgusted by people like this who want to “bum” off the land–contributing no skills, planning to be an “old hippie”. These bums are ruining Colorado. May be you should listen to the tape. This man wants to build a house on his own land. He is being refused permits. It is because 90% or more of the iraqi flats land owners can be seen from hwy. 160. And it looks like a public dump on most of these 5 acre pieces of sand.. buy up in the pinons or even higher if you can.. Lived in Colorado 10 years, sadly I left because the armpit of colorado (Denver) where the bulk of the pantywaists reside and dictate policy to the rest of the state has bred, invited, and nourished the current Obama way of liberalism to thrive. So seeing what was coming I voted with my feet and Colorado has reaped exactly what has been allowed to happen…..failed liberalism and now like locusts they will want to move on to another feed lot…..Such a shame, They live, they bred, and they vote. I lived in Denver, CO back between 1980 – 1985 and it was very conservative back in those days, but I remember big city libs from California and other big city states like Mich and Wis were moving there in droves. I remember when Colorado had that cowboy toughness about it but I guess that mentality is gone. What a shame. Libs are like a cancer. They just spread their disease wherever they go. After Colorado is destroyed completely by failed lib policies then they will move on to spread their sickness somewher else. Careful stef.. i am a 60 yr. Young pot growin, off grid hippie…lol. I find this to be despicable. Its a money grab, I applaud anyone who is knowledgeable enough to provide and live in a home without said utilities. Good for you. There should be no reason to change this zoning. Its actually a good thing not to have so many people drawing on an already overdrawn power grid. These people should be getting incentives to upgrade their properties to this kind of lifestyle. I understand if the property is unsightly like any other property , to need to clean it up, but to force people to live a certain way, is reprehensible. They should talk with Maine, the off griders. Get Maine to give them land with a real title or atleast provisions to allow them to live off grid on land they buy/rent, in exchange, the land is then developed to meet the new standards, with UN style dense population, then they can send Maine Muslim population there(land is given to Maine, and Maine can sit back, collect section 8 from the development, and get rid of their islamic population). Colorado has a more generous welfare system, and the overly Hispanic town can get some lovely diversity! This would take less then 6 months to do! I am not sure of all the dinamics of your situations but this I know. We should be able to live free on our own land as we please. Private property is one the of the foundational rocks that our Republic is built upon. Having said that, freedom comes with responsibilities; both to the land which we have been blessed with and to your neighbors. My 7th grade history teacher told me that my freedom ends where the other guys nose begins. So I would say, do to your neighbor as you would have them do to you. I hope it works out where justice is best served. God bless you all in your trials. West Virginia has many areas with NO zoning. Great folks, mostly Scot/Irish and German. Due to war on coal, lots of poverty, BUT it varies by county. Many live in the hollows, HUNT and fish, know how to survive, though there are drugs and the crime rate is not as low as it used to be. People usually MIND THEIR OWN BUSINESS, but if you are friendly and helpful most will help you. 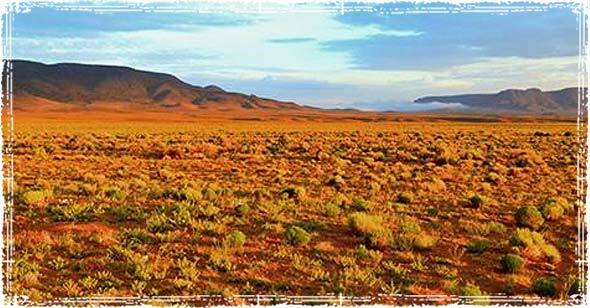 Beautiful state, and forgotten by most, which why it is mostly unspoiled! LOW property taxes. Unless some serious time is spent repealing some of the the hundreds of thousands of laws as a sign that Government recognizes it’s over reaching grabs on liberty, it’s Just a matter of time, before this all comes to a head. Good article,Thanks for your effort.Do you live off grid.Here in N.Y.The city reminds me more and more of the film “Soylent Green”.I want to move to an unincorporated county but now that Agenda 21 is now updated to 2030 the challenge has just increased. They are going to keep pushing until they are put down. They understand nothing else. This same problem is playing out everywhere – every city, state and county is under assault using the same tactics. Permits and statutory codes are being used as weapons against humanity, to drive people off of the land and into dense pack-n-stack urban cities. Fire permits, water rights, wetlands all used to deny people rights to live. No permit? One less ‘useless eater’ taking up space the elites would rather have for themselves. 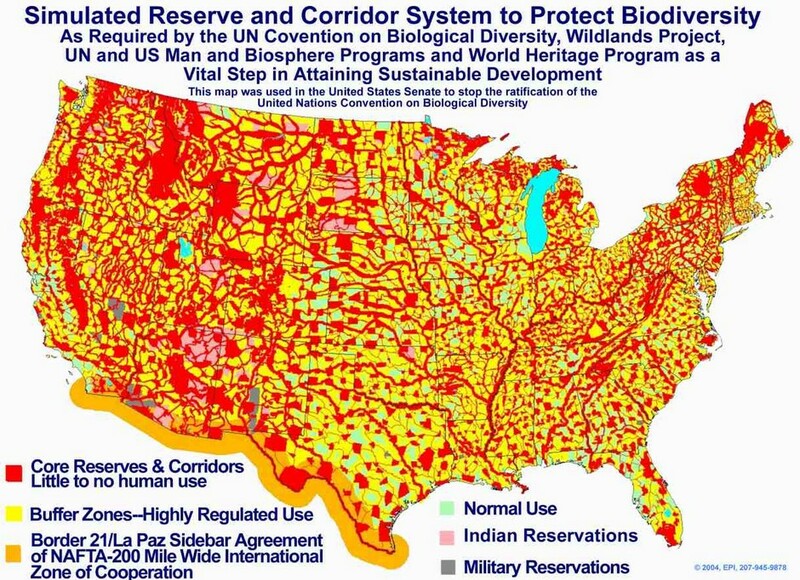 See the miniscule green spots on this map, to see where they will let you live. Red is completely off limits to humans, and yellow will be ‘highly regulated’, meaning regulated out of existence. It’s a full-frontal assault on humanity. Nowhere left to live free. Time to stop believing the zoning board has the authority to tell you what you can do with your own land. Do what you will. If men with guns come to your land, defend yourself. Make mutual defense pacts with your neighbors. While you’re at it, stop paying property tax, too. You can’t do that until you declare your independence from the nanny government and publish it for the public record. Only then will the statutory laws no longer apply. I lived off-grid in the high country of Costilla county for about 4 years a few seasons back. Loved it! I highly recommend it as a lifestyle. 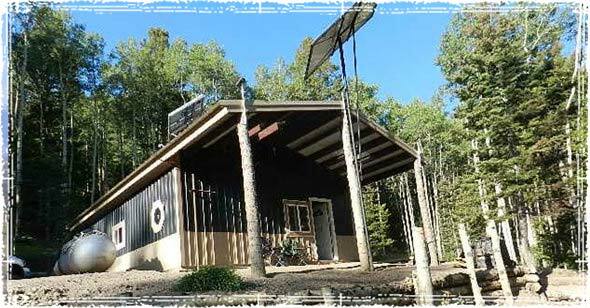 Lived for free, no utilities and a small tax footprint. This is about money. The county wants the permitting fees (at the time about $2400 per site), the inspectors want the inspection fees and the contractors want paid to put in your power, well and septic. It’s a small community and they are all related, well inspector is cousin to the land-use administrator whose wife’s uncle owns a backhoe to install septic systems. The above picture may not be completely accurate but you get the idea. A well will run you $20,000 add another $5,000 for a septic system. Grid attached power, if you can get it in your area, will cost roughly $10,000 per mile to run the lines. Plus, as I mentioned above, roughly $2400 in permitting fees. Glad I got out when I did. 1. The Constitution has been rescinded and the Common Law is dead, and they have NOT told us. 3. We, as a free person, have each one individually entered into some agreement with the government knowingly, willingly, and intentionally whereby we have agreed to perform as they say. If that is the case then the agreement must be produced and its validity determined. We are still free people if we will just claim it and stand on it. The Law is on our side. They are the lawbreakers.